Have you ever been bullied as a child & experienced the hurt & pain it’s caused mentally or even physically? Just think back on being in grade school & The memories of you weren’t so pleasant. You were the kid who didn’t have every new pair of shoes, maybe a little over weight, wore braces Or maybe you were the kid doing the bullying out of insecurities about yourself or even jealously. Those are just a few things kids experience today. While technology and social networks are at a all time high. Kids are now being cyber bullied & being humiliated online not just in person. 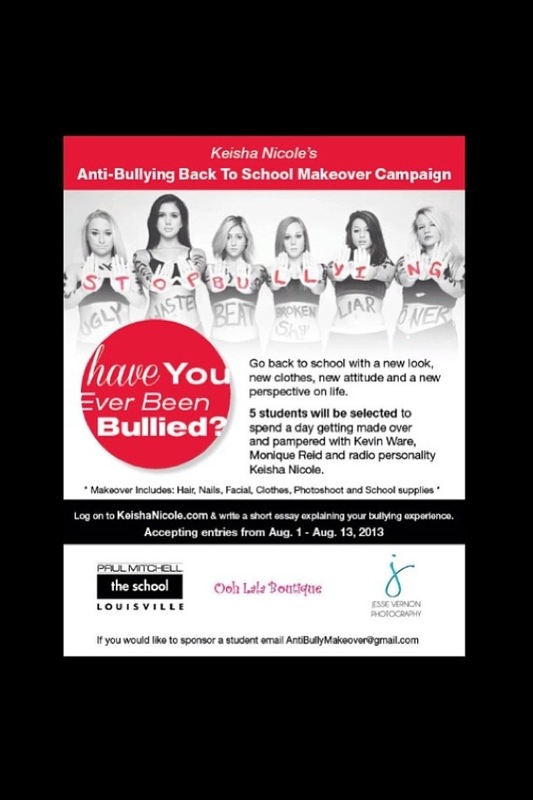 5 wonderful kids will have the chance to tell their story & get awareness out for bullying to win a complete makeover for school. Hair, nails, new clothes & school supplies. They also get to meet Myself, The University of Louisville basketball players Kevin Ware & Monique Reid. The campaign starts August 1 through August 13.